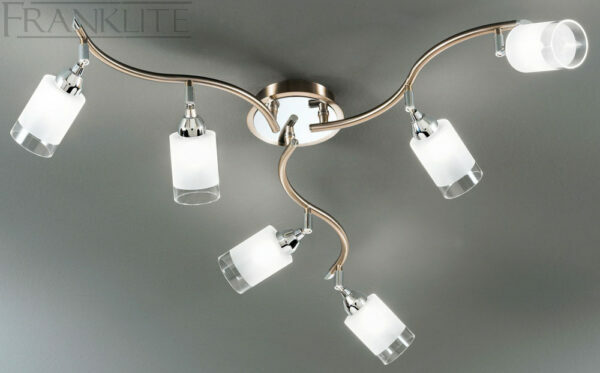 This Franklite Campani bronze finish 6 light large ceiling spot light plate with acid glass shades is stylish and practical; featuring a flush circular mount and three double curved arms finished in soft bronze, with six fully adjustable lights fitted with clear edged satin glass shades. A bright alternative to spotlights, this large ceiling mounted spot light plate can be used to brighten your large kitchen, home office, dining room or living room and the adjustable shades allow you to point them wherever you like. This light is supplied by Franklite Lighting who have been one of the pioneers in the design, manufacture and distribution of high quality lighting such as the Campani bronze finish 6 light large ceiling spot light plate with acid glass shades you see here.